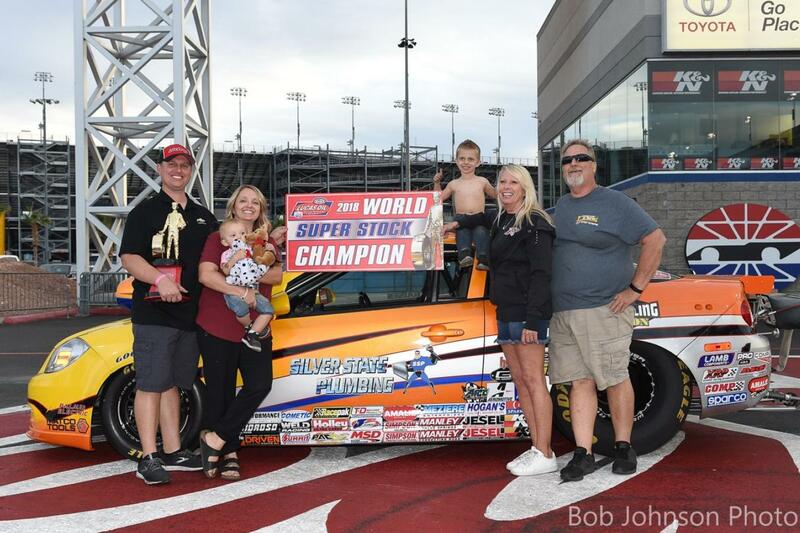 Henderson's Justin Lamb clinched his fifth career NHRA Lucas Oil Drag Racing Series world championship at The Strip at Las Vegas Motor Speedway on Sunday. A runner-up finish to Pete Peery in the Super Stock finals helped Lamb secure the title at the NHRA Pacific Division LODRS event. Lamb won Super Stock and Stock world championships last year and also won a Stock title in 2013 and a Super Stock crown in 2015. Lamb came into the weekend leading the points but with a number of racers still in the hunt for the championship. He worked his way through eliminations while the other contenders dropped out one by one, securing Lamb's fifth NHRA Lucas Oil World Championship. Lamb collected six wins in seven final rounds in Super Stock this year and was also contending for the Stock championship as well until this weekend. Lamb wasn't the only local to hoist a Wally over the weekend, as Las Vegas' Kahea Woods claimed the event win in the Sportsman Motorcycle class over Eric Jaquith. Woods made a pass of 8.771 seconds at 143.46 miles per hour in his '95 GSXR, while Jaquith, of Queen Creek, Ariz., posted a 9.538-second run at 140.50 in his '06 Hayabusa. Devin Isenhower, Brian McClanahan, Paul Nero and Ronnie Proctor also clinched NHRA LODRS world championships this weekend at The Strip at LVMS. Isenhower held a 10-point lead over Aaron Kinard in Super Gas coming into the weekend, but was out of events to claim toward his points championship so elected not to compete in the event. Kinard lost early, leaving only Michael Miller with a shot at catching Isenhower. Miller lost in round three, and Isenhower began the celebration from Lebanon, Ind. Isenhower had a pair of wins this year at Lucas Oil Raceway at Indianapolis, including the Chevrolet Performance NHRA U.S. Nationals and a final-round finish at the Lucas Oil divisional in Norwalk, Ohio. McClanahan, of Alta Loma, Calif., entered the weekend with a one-point lead in Stock Eliminator over Lamb as both drivers looked to add to their points totals. With a round-one victory and a loss by Lamb, McClanahan clinched the 2018 NHRA Lucas Oil Stock Eliminator World Championship. McClanahan joined his dad, Jerry, and son, Ryan, as three generations of NHRA Lucas Oil World Champions. Jerry won the NHRA Stock Championship in 1973, 1974 and 1978, and Ryan took the honors in 2010 in Super Stock. 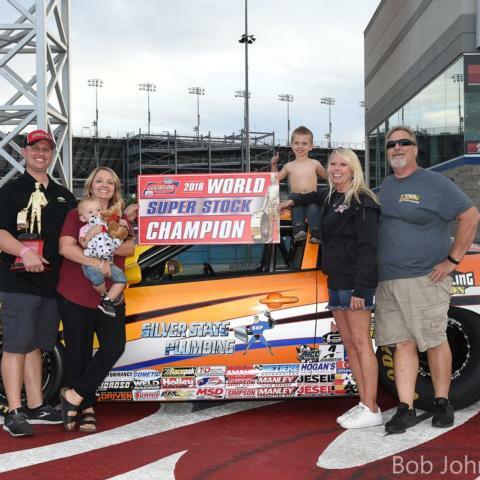 Racing to five final rounds this season, McClanahan grabbed an early win at the Pacific Division event at Wild Horse Pass Motorsports Park to go along with a final-round finish the week before at the NHRA Arizona Nationals. He then grabbed another runner-up finish in Fontana, Calif., and a win in Sonoma, Calif., in the middle of the season, followed by a win at the AAA NHRA Texas Fall Nationals outside Dallas. Eugene, Ore., racer Nero came into the weekend leading the points in Top Dragster presented by Racing RVs over Mark Jones, who needed to win the event to overtake Nero. Jones lost in round two, and the celebration began for Nero and his team. Nero started the season strong with national and divisional event wins in Phoenix at Wild Horse Pass. He then added a win at the NHRA Northwest divisional at Mission Raceway Park in Mission, B.C., in June and a final-round finish at Woodburn Dragstrip in July on his way to the Top Dragster Championship. In Top Sportsman presented by Racing RVs, Proctor was being chased by J.R. Lobner and Douglas Crumlich as the three were separated by just 18 points. Proctor won his first two matchups, with Lobner falling in round one and Crumlich in round two for Proctor to claim the 2018 Top Sportsman presented by Racing RVs World Championship. Proctor raced to three wins in four final rounds on the season, starting off with a national event win at Gainesville Raceway. He then won the Virginia Motorsports Park NHRA Northeast divisional in April and advanced to the final at Cecil County Dragway in August before taking the win at the NHRA Carolina Nationals at zMAX in Charlotte, N.C.
Frank Aragona leads the Comp Eliminator chase by 19 points over Clink Neff going into the Auto Club NHRA Finals at Auto Club Raceway, Nov. 8-11, and in Super Comp Steve Williams made a big jump to the top of the points with Don Nichols and Mark Grame still in contention. Kim Parker and Chris Marshall took home the wins in Top Alcohol Dragster and Top Alcohol Funny Car this weekend at The Strip at LVMS. Parker, of Graham, Wash., qualified No. 1, then took out Dan Mercier and Johnny Ahten in rounds one and two to advance to the alcohol dragster final against Shawn Cowie, who qualified No. 2. Cowie knocked out Matt Sackman and Duane Shields on his way to the final. Parker was out first as Cowie shook the tires and Parker led from start to finish, clocking in at 5.604 seconds at 259.21 mph for her second regional event win. Marshall came from the No. 4 spot and advanced to the funny car final with wins over 2017 World Champion Shane Westerfield and Jirka Kaplan. Ulf Leanders of Sweden took out Steve Burck and John Lombardo Jr. on his way to the final. Marshall, of McMinnville, Ore., took the holeshot and needed it to hold off the quicker Leanders. Marshall went 5.473 at 268.01 to defeat Leanders' 5.453, 268.01. Brian Hyerstay and Peery took home the trophies in Comp and Super Stock respectively. Hyerstay put Tony Mandella on the trailer, while Peery won over Lamb, who had just clinched the 2018 Super Stock World Championship earlier in the day. In the division's Top Dragster and Top Sportsman classes, Ed Olpin beat Steve Casner and Jeff Gillette won over Paul Mitsos. Rounding out the winners were: Joe Sorensen in Stock; Matt Woodard in Super Comp; Chris Cannon in Super Gas; and Ryan Herem in Super Street. Parker, 5.604, 259.21 def. Cowie, 6.521, 153.51. Marshall, 5.473, 268.01 def. Leanders, 5.463, 268.01. Brian Hyerstay, Eugene, Ore., dragster, G/D, 8.778, 145.31 def. Tony Mandella, Eastvale, Calif., '92 Camaro, A/SMA, 8.052, 157.52. Pete Peery, Bowie, Texas, '05 Sunfire, FGT/E, 9.330, 143.86 def. Justin Lamb, Henderson, Nev., '10 Cobalt, SS/AM, 8.698, 156.10. Joe Sorensen, Woodburn, Ore., '69 Camaro, G/SA, 11.420, 114.71 def. Darrick Ellam, Ridgefield, Wash., '76 Pinto Wagon, W/SA, 16.541, 75.74. Matt Woodard, Petaluma, Calif., dragster, 9.069, 177.91 def. Ken Mostowich, Calgary, Alb., '68 Camaro, 9.074, 168.07. Chris Cannon, Bothell, Wash., '63 Corvette, 10.044, 164.47 def. Steve Williams, Beaumont, Calif., '63 Corvette, 10.043, 173.14. Ryan Herem, Canyon Country, Calif., '69 Camaro, 11.054, 143.00 def. John Dexter, Surprise, Ariz., '68 Camaro, 11.052, 141.27. Jeff Gillette, Benicia, Calif., '06 GTO, 6.938, 200.00 def. Paul Mitsos, Eastvale, Calif., '08 Stratus, 7.247, 187.31. Ed Olpin, Pleasant Grove, Utah, dragster, 6.822, 198.79 def. Steve Casner, Sheridan, Calif., dragster, 6.698, 203.22. Kahea Woods, Las Vegas, Nev., '95 GSXR, 8.771, 143.46 def. Eric Jaquith, Queen Creek, Ariz., '06 Hayabusa, 9.538, 140.50.